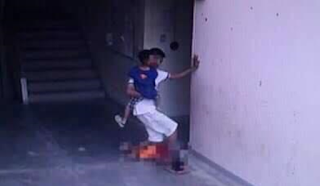 Heartbreaking Video of Man Caught on CCTV Savagely Stomping 7-year-old Boy's Head. 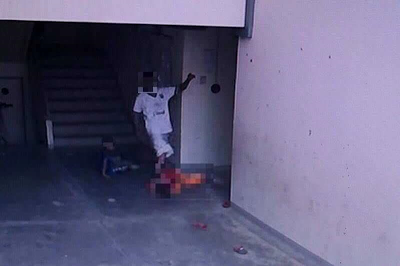 A 43-year-old man was caught on camera stomping a 7-year-old boy’s head because he thought the child made his son cry. 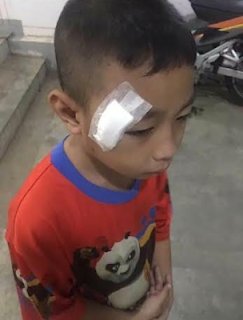 Amnat Salubthong was arrested today, Wednesday, after security footage from a housing complex in northeastern Bangkok, Thailand went viral, showing him run down the stairs and charge at the 7-year-old, who was playing with his 6-year-old son. He kicked the child repeatedly before taking his son back upstairs to his apartment on Panya-Ramintra Road in the Khlong Sam Wa district. "Amnat came to the police station yesterday and admitted he assaulted the kid," Maj. Saowaluck Suwanmanee of Khanna Yao police said. After turning himself in, Amnat told police he ran down from his fifth floor room to where the children were playing because he heard his son crying. He admitted to brutalizing the child because he could not control his rage. Police were gathering evidence in order to file charges against Amnat later today, Maj. Saowaluck said.